Interview with Professor Alex Linley Ph.D.
Home Positive Psychology and Coaching Interviews Interview with Professor Alex Linley Ph.D. THE Q&A INTERVIEW WITH ALEX LINLEY, Ph.D.
Alex has written, co-written, or edited more than 120 research articles and book chapters, and five books. His newest book, co-authored with Janet Willars and Robert Biswas-Diener, is The Strengths Book: Be Confident, Be Successful, and Enjoy Better Relationships by Realizing the Best of You. Alex is also an extraordinary teacher (We’re proud that he taught two master classes for us! ), articulate, and unpretentious. This should be a cool, fun hour. THE RECORDING: To receive your copy of the digital recording of Alex’s interview, just type your name and email address below. You’ll receive my email–with a link to the recording–within a few minutes. Alex Linley, Ph.D. is a psychologist and social entrepreneur. After time spent working first in business and then in academia, in 2005 Alex founded the Centre of Applied Positive Psychology, where he is now Director. CAPP is a social business, registered as a not-for-profit company limited by guarantee, and is focused on the applications of strengths in organisations and schools. CAPP’s profits are reinvested in its mission of Strengthening the World, a mission which is also supported through the charitable works of The Strengths Project, of which Alex is a Founding Trustee. Alex holds the position of Visiting Professor in Psychology at the University of Leicester, and has delivered keynote presentations on strengths and positive psychology throughout Europe and in the Caribbean, the United States, and India. Alex has a first class BSc (Hons) Psychology degree from the University of Leicester and a PhD in Psychology from the University of Warwick. He is a Chartered Psychologist with the British Psychological Society, holds the British Psychological Society Certificates of Competence in Occupational Testing (Level A and Level B), and is an accredited business coach. He has written, co-written, or edited more than 120 research articles and book chapters, and five books, including Positive Psychology in Practice (Wiley, 2004) and Average to A+: Realising Strengths in Yourself and Others (CAPP Press, 2008). He is an Associate Editor of the Encyclopaedia of Positive Psychology and the Journal of Positive Psychology, as well as Co-Editor of the International Coaching Psychology Review, and a regular reviewer for a number of journals, publishers, and grant awarding bodies. 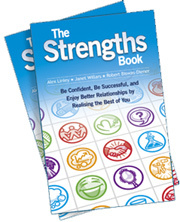 His newest book, co-authored with Janet Willars and Robert Biswas-Diener, is The Strengths Book: Identify Your Strengths, Be Confident, Be Successful, and Enjoy Better Relationships by Realising the Best of You. Alex wrote the business case that was used to help launch the National Talent Bank, an initiative of the Council on Social Action, chaired by the Prime Minister and launched at 10 Downing Street in July 2009. He is currently serving as a member of the Steering Committee for the National Talent Bank. Alex lives with his wife and their four children in Coventry, a city in England, 95 miles (153 km) northwest of London.